I am on a flight right now out of Milwaukee heading to Orlando. Hitting Disney World in some form tonight. The main reason for the trip is to attend a conference on Global Data Standards at the Marriott World Center. Holly is coming down on Friday and we will spend a few nights at Animal Kingdom Lodge. It's her birthday on Monday and we are celebrating at Victoria and Albert's chef's table. For tonight: Epcot has Extra Magic Hours til Midnight. I may get there around 8. Time enough to eat, see Illuminations, renew my annual pass. AllEars lists a bunch of restaurants are open but last time I went to an Epcot EMH hardly a thing was open. Since I'm not a resort guest I can't ride anything. Plan B is Downtown Disney with dinner at Bongos since I've never been there. Here's Holly's race report and shots from the race. Our friend Sara from Team AllEars is also in the video a few times. At race village. Temp is between "miserable cold" and just "cold"
On the latest season of Survivor Boston Rob admitted that he named the merged tribe after one of Amber's stuffed animals. If he can admit that to millions we can make a similar statement on a blog only a few folks will read. Tizzel is a bear Dave bought Holly many years ago. He comes from a very humble background and has wiggled his way out of poverty by breaking the bank at a local casino. Even with all his money he still sells his wood crafts (birdhouses and such) at a kiosk in the local mall. He also hosts an afternoon syndicated tv talk show. "Tizzel" has always been a go-to name in our house. The router needs a name: Tizzel. Dave's iPhone is Tizzel. 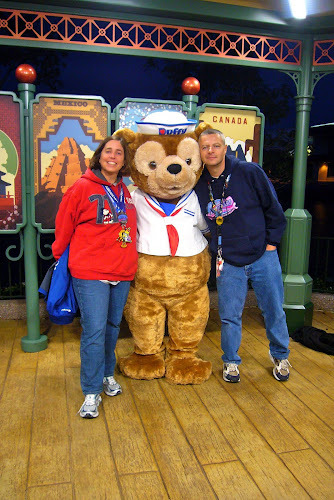 Team Tizzel made its first appearance at Walt Disney World in October 2010 at the disneyfoodblog Foodie Fest.. Since we've used him as a team mascot before.........We Are Team Tizzel! Team AllEars is comprised of AllEars® fans running in the January 2012 Walt Disney World 5K, Half and Full Marathons. Each member commits to raising a minimum of $500 for the Avon Walk for Breast Cancer! Holly has been a member of Team Allears since it's inception in 2010. This is Dave's first year as a team member.